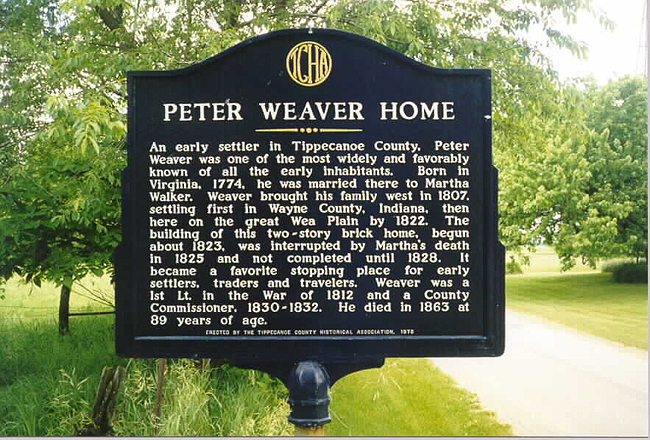 An early settler in Tippecanoe County, Peter Weaver was one of the most widely and favorably known of all the early inhabitants. Born in Virginia, 1774, he was married there to Martha Walker. Weaver brought his family west in 1807, settling first in Wayne Co., Indiana, then here on the great Wea Plain by 1822. 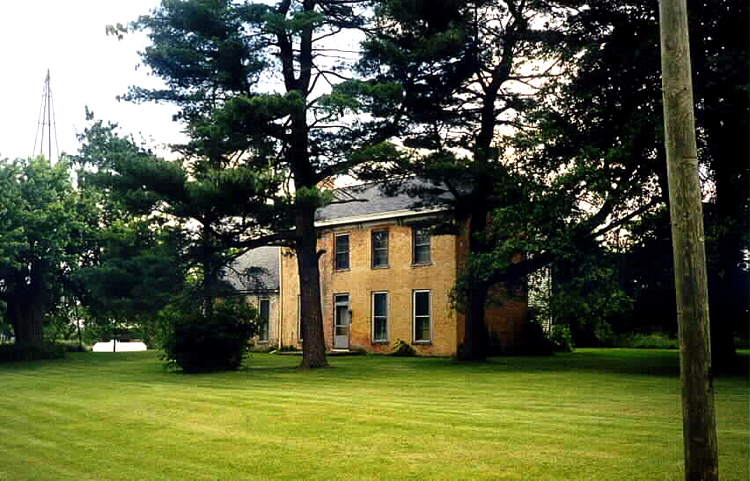 The building of this two-story brick home, begun about 1823, was interrupted by Martha's death in 1825 and not completed until 1828. It became a favorite stopping place for early settlers, traders and travelers. Weaver was a 1st Lt. in the War of 1812 and a County Commissioner, 1830-1832. He died in 1863 at 89 years of age. Erected by the Tippecanoe County Historical Association, 1976. Located on county road 850 S. in Wayne Township. "The first settler of a county is always a notable character in local history. His cabin is pointed out as a landmark as long as it lasts, events are dated from his arrival and comparisons are always in order between conditions then prevailing and those of later days. To Peter Weaver falls the honor of being the first settler of Tippecanoe county. He came from Virginia, was the son of another Peter Weaver, whose ancestry originated in Germany, but little is known of the genealogy beyond this point. Peter Weaver, the second, married Martha, daughter of Henry Walker, an early settler of Virginia, of Scotch-English descent. In 1807 he brought his family to Indiana and settled in what is now Wayne county, three miles south of Richmond. Eventually he acquired a good estate, all of which was lost by becoming bondsman for the sheriff. This reverse compelled him to begin life over again and he decided to seek an entirely different location. While serving as a lieutenant in a company of rangers during the war of 1812, he had visited the Wabash valley and was impressed with the fertility of the soil in the prairie section. So in 1822 he came to what is now Wayne township, Tippecanoe county, entered a tract of land adjoining Burnett's Reserve, and by the time of his death had entirely recouped his fortunes, though the building up of his new property cost him many a weary day's work and much anxious thought. He was one of the leading men of the county at that early day, served several years as county commissioner and was at the front in all movements to bring about a betterment of conditions. He died in March, 1863, when ninety-six years old, his wife preceding him to the grave many years, as her death occurred in 1825, when she was only forty-two. They had seven children."